QinetiQ Sentry – Unmanned Jet Skis For The Military | OhGizmo! QinetiQ, a defense contractor from the UK with poor spelling has developed an unmanned maritime reconnaissance vehicle that’s about the size of an average jet-ski. The small craft is designed for multiple military or security-based roles including harbor patrol, battlefield reconnaissance, intruder investigation and even damage assessment all without risking the lives of any sailors. And even though it’s only about 3.5 meters in length the Sentry still has an advanced stealth design, is capable of speeds up to 50 knots and can run for about 6 hours at a time. 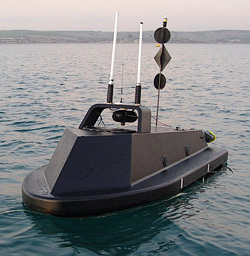 It can also be configured to operate by remote using a simple PC-based console or it can be programmed to autonomously carry out pre-planned missions like patrolling a particular body of water. The Sentry is yet another step in the military’s slow transition to unmanned vehicles. Not only do the remotely operated craft remove the military personnel from any danger but it also means the vehicles can be smaller and more fuel-efficient since they don’t need to accommodate a human pilot or any of the life-support and emergency systems that are required. Ohhh, it’s an Aquatic Dalek? !